We were honored to be asked to speak in front of the Florida Superior Small Lodging Group today and to talk about this subject with its members. 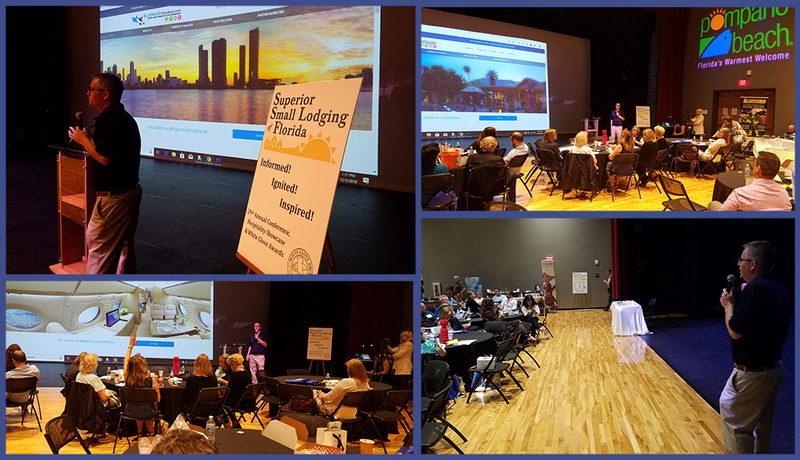 It was fun sharing the concept with many local owners and SSL members in person, but it will be exciting to share this knowledge in the days to come with all of those online who could not join us at the ANNUAL WHITE GLOVE AWARDS held in Pompano Beach at the Cultural Center. Today owners and SSL members alike learned that using quality content is one of the easiest ways that a business can dramatically improve their online presence organically. Our own Steven Richner covered these subjects and more as he demonstrated the importance of valid and accurate information. Importance and rank are determined by the Google AI. The job of the AI is to determine the validity, worth, and weight of the information. Having good information and a completed business profile is the TOP priority. Amenities are the single most influential driver of an online reservation. By displaying amenities through Google Maps Certified Imagery you afford the Google AI an opportunity to understand what your business has to offer users who might be searching for lodging in your area. Your Google Maps Imagery must be complete, updated regularly and accurately. The AI will actually check to see when and where the photo was created in the meta-information of the image. So using current Google Certified Imagery ONLY of your business location is highly recommended. Google, Apple, Facebook, and YouTube have turned focus and attention to what they call, “Immersive Storytelling” Through the use of 360 Imagery, Google Maps Street View, and 360 Video business owners can now tell the story of their business in a way they never could before. 1.8 Million OCULUS GO headsets were sold in 2018 and now with the launch of the improved OCULUS QUEST VR headsets and others like it, 2019 is expected to be even bigger. On November 12th, 2018, Google and YouTube announced the launch of YouTube VR, a native VR App for searching and experiencing 360 VR Videos. Businesses that will most benefit from this will be those that understand the importance of telling their business story in this new format and deliver quality content. Steve Richner is one of the lead developers and a production manager for BLUERAVENStudios.com, a cutting-edge digital marketing and virtual reality studio based in Ft. Lauderdale. After attending the University of South Florida in Tampa, FL, Steve went to work for one of the first nationally accredited online training providers where he helped hundreds of companies set up online training programs. Steve has been working with industry leading, high tech, online companies ever since. For the past 5+ years, while working with BLUERAVENStudios.com and the Google Certified Photographers Steve has assisted thousands of local companies to improve their Google listings, websites, and social media pages. Steve led his team to many Google “top performer” awards. Steve is a veteran of creating and managing digital and virtual reality content to help clients see their ideas come to life and increase bottom line profits. Please give Steve a call if you are looking to improve your online presence. Steve resides in Boca Raton, Florida with his beautiful wife Karen and their three teenage girls. Steve would be happy to speak with you regarding your digital and Google listing needs. He also braves the South Florida traffic all the time to go meet with clients face to face, the old-fashioned way. Steve has become an expert in his field and truly loves meeting with local businesses to see how he and the team can help!